One of these students will be much better educated. Apparently. This week, School’s Minister, Nick Gibb, gave this speech setting out the social justice case for an academic curriculum – aka making the Ebacc a compulsory entitlement for all students. When this kicks in it will have a significant effect for a lot of schools where the study of a language and/or either History or Geography are not currently compulsory at KS4. It’s important to stress that I do agree with a lot of what is said in the speech. In general, I agree that up to KS4, a broad curriculum with a strong academic weighting is important and should be an entitlement for all young people, regardless of their circumstances. There’s plenty of scope to specialise and to pursue technical learning routes from 16 onwards. I agree that too many students have been sold short by self-fulfilling low expectations around their capacity to engage in an academic curriculum. At Highbury Grove where we have over 70% of students on FSM, we’ve introduced a curriculum where languages and humanities subjects are compulsory at KS4; there are no longer separate pathways in KS3 or KS4 for students of different levels of prior attainment – again, because of the self-limiting effect that has had. What used to be called ‘Pathway 1’ is now open to everyone. There is no ‘Pathway 2’. Our KS4 ‘Bacc’ includes a compulsory arts GCSE and a more open interpretation in the humanities block. With this, in conjunction with a commitment to outdoor education, music provision and a Bacc-style post-16 offer, we think our Comprehensive Curriculum for All provides all young people with the basis of an outstanding education, rich in cultural capital. And yet, we’re still not fully Ebacc compliant. Mr Gibb, in all his wisdom, apparently knows better and is preaching to me about social justice from his lofty perch. 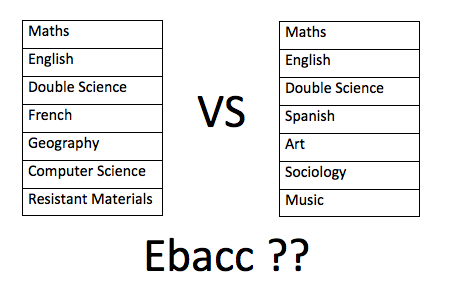 So, although EBacc for All isn’t a massive shock or threat to us, there are some major issues with it. 1. It’s puny and pale without the arts. The absence of the arts subjects from the Ebacc has always been its major weakness. I’d be far happier with Ebacc if there were six elements, not just five. There’s a foolish assumption that arts subjects are inherently less demanding or less rigorous. My daughter has an A* in Drama and in Art at GCSE – she’d have quite a lot to say about that. They were rigorous, intellectually demanding and challenging, both making a significant contribution to her learning experience at KS4. Interestingly, in our first year of arts for all in our GCSE options, students found it the hardest part of the compulsion. For many, being made to engage in the arts is challenging – I think that’s significant. They aren’t rushing to it as an easy option – far from it. The current formulation of Ebacc is sub-standard for this reason alone. It’s just not challenging enough. In Nick Gibb’s speech, there’s a reference to the government’s commitment to the music and dance. This is a project spending £100+million to pay for students to go to special music and dance schools; it’s a scheme to give a limited number of children access to elite provision – this is not about universal entitlement to a proper arts education; it’s not the way to spend that money. Some people argue that KS3 arts should cover it – but that argument applies to all subjects and I don’t think arts or languages are inherently different in this regard. Surely, any Bacc worthy of the name would include arts subjects. 2. Only History or Geography? I’ve never really understood this. At HGS, sociology is popular and is taught in a way that is extremely rigorous. It’s a proper discipline. Looking at specifications and exam questions, I think it is impossible to make a case for geography being ‘more academic’ than sociology at GCSE. Arguably, sociology overlaps more with both history and geography in terms of the different subject matter and the mode of academic study than history and geography overlap with each other. If the argument is about content, we’d need to debate including history for all or geography for all; allowing that either could be dropped undermines that case. If it’s about ‘academic rigour’ in general, there is no basis for excluding sociology. RE or RS is a more subtle issue. RS has suffered reputational damage over the years and the case for RS has been undermined by schools that have delivered condensed compulsory courses in a way that would never be done for history. A typical RS exam paper can feel that you could give it a fair go based on general knowledge of contemporary social issues and I would suggest RS needs more philosophical content and a stronger comparative strand. Currently, in schools that prize league table scores over educational integrity, there would be high take-up of RS for tactical reasons if it was included in the EBacc. Sadly. But that doesn’t mean that RS is inherently less valuable – it shouldn’t be and exam boards could do more to make that evident to all. At HGS, GCSE RS has parity; it’s firmly in our Bacc. Gibb’s speech has reminded me that our ‘Ebacc for all’ claim is wrong; that RS and sociology don’t count. To me ‘humanities and languages’ for all should be enough. I’m now wondering what they’ll do to us if we just carry on. It might make an interesting court case to challenge the SOS’s power to decide which subjects are more academic than others. It’s important to see the Ebacc in the context of Progress 8 and Attainment 8. With the double weighting of maths and English, schools are already acting (tactics over principle) to swing more time behind the core. I know several schools now only offering three options. At KEGS we had five options; this allowed for History AND Geography; two languages or two arts. This was real breadth. At HGS we’re sticking with our four options – it’s a good balance. You can do two humanities or two arts; you can still do a language, computing and various other combinations. With schools now forced to chase the P8/A8 and Ebacc, the choices are really very narrow. How does it equate to social justice if students can’t get anywhere near the curriculum breadth the Grammar school kids get? They’re being robbed; shackled, not liberated. Maths and English matter a lot but not so much that arts and a breadth of disciplines get squeezed out. I predict that fewer students will now study both Geography and History at GCSE – that’s a loss. Arts courses will close; that’ s a tragedy. This is the consequence of a low-trust high-accountability system; we get perverse incentives for schools to act in certain ways that can’t be justified on principle. I believe that if we follow Ebacc compliance, we’ll be offering a more limited curriculum. If we chased P8 glory by squeezing time for options, it would be worse still. All the rhetoric of freedoms for academies is rendered hollow in the face of this centralising power. If my school community supports our curriculum as it does, why should we make it worse to suit someone else’s prejudices? That’s not democracy. Of course, the biggest issue of all is the audacity to call Ebacc a ‘Baccalaureate’ at all. The relentless emphasis on KS4 is such an utterly, utterly desperately limited vision for the education for our young people. It makes me cringe thinking of Nick Gibb standing up proclaiming social justice via Ebacc…. as if!! The opportunity is there to create a real 14-19 Baccalaureate with real power; a Bacc worthy of the name. Ebacc is so full of holes in principle and in practice – we’ve got to think much bigger if we’re serious about social justice. And I assume we are. Spot on Tom . The lack of any overarching 14-19 strategy is simply breathtaking and beggars belief when the govt wants everyone in education employment or training . Thanks Kevin. It’s total blindness – almost willfully so. I don’t understand it. Very useful and interesting, thanks Tom. Would be interested to hear your views on the place of the sciences within this (the one main aspect you don’t address here). Double, Triple, Further Additional, Applied etc. What’s your thoughts on what constitutes an equitable and aspirational curriculum offer *for all*? Reblogged this on Burt's Drama. THIS is the comment that says it all for me and captures everything that is wrong about the Ebacc. It is very limiting to young people and their choices. Having to study specific GCSE’s that may not suit them, their learning need or their career goal. I agree – How is that social justice? P.s. Reblogged on This Education Blog. Thanks. For me, the most telling part of this insightful blog was the section on studying the arts. We are doing our young people no favours if we offer them an unrelenting so called ‘academic’ diet that requires a particular set of skills, but that leaves them struggling when faced with different types of activities and ways of creating, working and learning. No wonder pupils find arts subjects challenging in such a single minded, limiting view of what constitutes ‘valuable’ (and therefore compulsory) learning. Yet it is these different, but equally rigorous, opportunities that will stretch and challenge young people and make them better able to flourish in a highly competitive workplace that needs and values a broad range of abilities, not just the ability to learn how to study so called academic subjects. I welcome the potential changes, but needs to be beyond just the type of subject, and look at how the students are assessed and the skills they gain from it. As an A level teacher I find too many ‘high achievers’ from GCSE struggle with the transition and lack the basic skills needed. The focus of Year 10-11 needs to be beyond the A*-C league tables. The focus on teaching to the test is to blame for the lack of skills required for independent learning and research and A level study. League table points take precedence over creative thinking and problem solving. We focus our efforts on improving Maths and English, withdrawing students from ‘less important ‘ lessons in order to cram for those exams. As for the side lining of Art, Drama and Music strange how these subjects probably require more spending than your traditional text book lessons. At a time of further ruthless cuts it makes perfect sense that the Sec of State limits the curriculum choices at our disposal. We have taken similar decisions as a school but would argue that it is right in principle – indeed discussions about how it would impact on P8 and A8 measures came very late in the day (and even later statistical modelling indicates that it will weaken our P8 and A8 scores a bit as there will be less choice of which grades to put into the baskets – ie. it won’t be a case of do 11 subjects and pick best 8, thus ignoring worst 3 – now pretty much every grade and every subject will count). Our decision was based on the principle that we wanted students to be able to explore their subjects as widely as possible – to go off and explore areas in depth rather than being straight-jacketed by time. We were also mindful of the growth in content of GCSE Maths and want to teach it properly rather than an express train rattling through topics at a surface level and our belief that RE (taught properly around philosophy and ethics) should have a central place in our curriculum. We are proud that our curriculum has always been built around well established academically rigorous subjects – we’ve never dabbled with some of the equivalent to GCSE courses, or stacked up multiple short-course GCSEs and the like to add up to several full GCSEs. So there we go – please let’s not assume that every school doing 3 options has done so as some of of gaming technique for P8 and A8. Thanks for the reply. Sorry for giving that impression. I hear the tactics-over-principle stuff a lot. If RE is core, you’ll obviously have less time for other options so I guess that’s a compromise you have to make. Will you make arts compulsory as your 3rd option after Hist/Geog, MFL or soften the core RE to give more flexibility? Sorry Steve but I think in this instance emotive language can be excused as this is an emotive issue. To not allow emotion as a valid for of debate is to overlook the very point of the arts. In the anticipated scenario befalling us we will lose creative teachers, resources nd expertise on a national level. This is already happening and will accelerate. It’s consequences might be felt in industry when business leaders are looking for creative brains and struggle to find them. I completely agree with this. As a Geographer I am extremely concerned that Geography will die a slow death as a result of eBacc – many schools and parents seem to prioritise History. I also believe that the study of both subjects gives a really clear understanding of aspects of UK and the world that students need to help them show a breadth of understanding of the society in which we live. Arts; especially music and art can also help with this broader level of knowledge that helps successful people function. I also think however that in some schools (mine included) that we also need to look at arts (especially music) at a broader level – are all students being given the opportunity to participate in music outside of lessons? Poor old Design and Technology. Thanks for this post Tom – I think you have hit the nail on the head. The Baccalaurate principle allows for rigour while maintaining a broad curriculum. The ‘EBacc’ is too narrow and restricts breadth. More flexibility in the humanities and inclusion of the arts, as you propose, would be a sensible and enriching improvement. In 1972, John Berger’s seminal book Ways of Seeing changed the way people thought about the visual world. Berger argued that ‘when we see, we are not just looking, we are reading the language of images’. In other words, art is an intellectual discipline, which the Ebacc fails to recognise. And being able to read the language of images enhances any subject. I am an artist with children at Highbury Grove and I couldn’t agree more with what you say. As many UK artists have been arguing passionately for some time, there is no social justice in a compulsory Ebacc without the arts. There is no social justice in a system in which only independent and selective schools are able to offer high quality arts education. The Cultural Learning Alliance has been busy providing an evidence base for this, as if one were really needed. Artists who teach in art schools (as most do) have been seeing a changed demographic – art schools are becoming the preserve of the wealthy. Credit should be given to your enlightened move to continue to support the artist-in-residence post within the art department at Highbury Grove, established with Cubitt, a local organization run by artists for artists. Supporting art departments is vital in the current climate and they are often poorly resourced – I once witnessed a CPD session in which staff were given school drawing and painting materials and professional materials. They wondered how the children ever made any work using the school materials. But no one would expect a child to play a violin that didn’t work. The Children’s Laureate, Chris Riddell said some good things about art in schools this week. It’s great that this award, given by librarians, has this time gone to an artist. What I liked most was Riddell’s stated ambition is that everyone is given time to draw every day. This is something that Cubitt actually put into practise in primary schools in Islington in the early days of Cubitt Education’s programme and led to its remarkable work with Islington secondary schools. The artists of the future are in our schools. I have spent a lot of time during the last two decades, both as an individual and with institutions and universities, working to support the idea that art is a vital part of a young person’s (of for that matter any person’s) development and that the acquisition of visual knowledge is as challenging as that of any other kind of knowledge. The Ebacc simply doesn’t give this the time of day. I have been observing my oldest’s progression through GCSE art. Even at HG, I am struck by how little time there is in school to make art and study art history due to the constraints of the curriculum (and that is pre-Ebacc), and by how little grasp many of the students seemed to have at the outset of the amount of time it would be necessary to give to art to get a good grade. As you point out, art is a pretty tough option. Students and their parents don’t question this need for time for the more ‘academic’ subjects (a misnomer perhaps, artists are often highly academic thinkers). I think this is because they have absorbed the idea, right from the start at primary school, that art is not as serious or as important a subject as others – despite the efforts of art staff. The new HG curriculum is certainly a good thing. But even at HG, under this new curriculum, it will be difficult for a student to study arts music and languages together. As the CLA has shown, schools began to remove art from the curriculum two years ago, and even schools like HG could become unusual. In many schools art takes second place to music (I’ve visited at lot of art departments). There’s a strong and exemplarly culture of ‘music every day’ for those who want it at HG and I think the same could be true for art. For sure, art isn’t as easy for viewers to grasp as music, which can be a performative group activity that makes for a great school community occasion. My kids are very involved in music and HG and benefitting from it more than I can say. But art is, as it has always been, central to our increasingly visual culture. It isn’t just about painting and drawing because the world has changed (my own career as an artist has always been firmly based in writing). It isn’t always easily consumable. And the process is as important as the result. We don’t just teach kids about art so they can become artists, we teach them about it so that they can develop their intellect in order to reason with and enquire about the world – the same reason that we teach them any subject. I don’t have a vested interest in supporting art in schools for my own childrens’ sake. I don’t know that I have ‘artistic’ children, whatever that means (I have always wondered…!). Time will tell. I believe that being artistic is having a passion for the visual and an imperative desire for intellectual enquiry, coupled by a fascination with research into why visual culture is the way it is and how it got to be that way. Art is a test bed for the future, too. I don’t just believe this; I know it to be true. I haven’t met an artist who doesn’t think this way. Young people who are especially talented will find art a hard choice to make in future (a parent once said to me that she wouldn’t allow her son to choose art specialist school because it would be a waste of his time and wouldn’t get him anywhere in life – and I lost count of the number of times I dealt with unsolicited opinions of this sort early in my own career, despite doing rather well at it). The Ebacc as it stands will be the nail in the coffin for many art departments. Art is a path that is possible for fewer school leavers every year, as students are reluctant to go into debt without promise of financial security. Art schools are full not of local students from a range of family backgrounds but of overseas students and those from privileged backgrounds. This is something that artists in residence at schools know only too well, they have witnessed this first hand. The all too rare students from less privileged backgrounds I have taught over the years found themselves increasingly the odd ones out in art school. In the end, I am not sure that I think more students should be able to go to art school (and this is not the only reason to study art). It’s a tough world financially for graduates. Those who really do have the desire and the talent will become artists, art school or no art school, money or no money. That’s why there has always been and always will be art. To become an artist you have to be really, really determined and have a huge amount of conviction but you can do it and you will, if you love art enough. Any student should be able to choose that path. Or to have the opportunity simply to learn about art as they learn about other subjects so that they can ‘read the language of images’. But in both cases the odds are stacked against those from less privileged backgrounds and that is why it is so important that art is as highly valued in schools as any other subject. If the Ebacc makes this impossible it must be challenged. As Berger says, ‘Seeing comes before words. the child looks and recognises before it can speak.’ And the role of art in the history of civilisation and the conceptualisation of the future just can’t be wrong. Whenever this debate comes up, I often find myself thinking about my own KS4 experiences. GCSEs were relatively new, the term KS4 was not around. People were still discussing the audacity of a government to ditch the old O-levels. Yet still I consider myself and my high school friends to be quite well educated. Our comprehensive school did good work with all of us in my opinion. But what about breadth? We went to a school that organised it’s day into 5 lots of 35 minute lessons, with a break in the morning and a good long (sometimes it felt too long) lunchtime. We also had a huge range of after school activities to get involved in, if we wanted. At the time it was compulsory for all students to do maths, English and Science. That was it. If I remember correctly, our year was the first year made to do Double Award Science, a crazy scheme by which you study chemistry, physics and biology as if they were studied separately to the depth of a single subject and you were assessed by just two combined exams at the very end. Stressful. To make matters worse, those of us considered to be in the top ability range had to do both English Language and English Literature GCSES, separate subjects taught in the same time every one else just did one. So that makes 5 of my GCSES. But what about GCSE options? I made my choices in 1990. My school had the good fortune to offer us 4 option blocks with subjects arranged in such a way as that even if you were a science geek like me you had to do a humanties subject (RE, history, geography, Latin and economics were available). We also had to pick a modern foreign language (French or German) and an arts subject (from art, music or drama and I think thinks like sewing and home ec were in this block too). Then there was a random block to choose whatever you wanted (as well as many of the other subjects already mentioned it was this block that enabled me to do IT). So in the end I managed to get maths, music, double science, English Lit, English Lang, German, Economics, and IT. I have one other GCSE that I did as an extra subject in 6th form (Sociology, which I found not only interesting but rigorous and a welcome break to my science heavy A-level choices). In short, I think my school was able to offer me a broad education that I feel set me up wonderfully for my path in life, and managed to instill in me a love of learning and reading to boot. Why is it so hard for modern schools to do this? I went to an average comprehensive, grew up in poverty on a council estate. I know many of my former classmates who have managed to become productive and happy adults who look fondly back on our time and I consider them all as well educated. What is it that is stopping schools managing to do today what my school did with me all those years ago? I certainly don’t believe it is because of lack of trained or committed staff. But it is something we need to take a long hard look at. A very compelling argument, thanks Tom. As a school governor there are some particularly useful points here. What are your thoughts on what would constitute an equitable and aspirational curriculum offer in science *for all*? Only History or Geography? – Surprised you didn’t include Economics alongside Sociology as being equally or more academic than Geography. Economics is one of the fastest growing A level subjects, and an extremely popular and growing choice at our school at GCSE . I’m glad students and parents are ignoring the government on this one. A good break time read, thanks Tom. Can I email you about something vaguely related?